What Does Your Company’s Sign Say About Your Business? 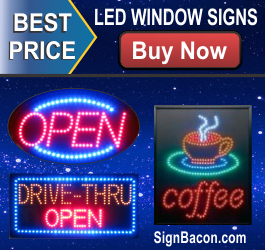 — Addisigns, Inc.
What Does Your Company’s Sign Say About Your Business? If you have a business with a physical storefront, then you should already be aware of the importance of maintaining a clean and welcoming storefront. After all, doing so will invite more customers to come check out your business. Unfortunately, one aspect of a business’ exterior appearance that often gets overlooked is the company’s signage. If your sign is unattractive, this can say a great deal about your business to passersby as well. It is important that your business’ sign reflects the best things about your company. For example, if you want your business storefront to be inviting and fun, then you will want to make sure that this is reflected in your sign. You may consider using fun fonts and bright colors to entice more people to come into your store, rather than using dull fonts and very few colors. Furthermore, the use of imagery on your sign can also be effective. For example, if you own a restaurant, why not display an image of some of your chef’s best dishes right on your sign? This will only entice more hungry guests to come into your restaurant, whereas a plan sign with so imagery may not have the same effect. On the other hand, if you run a business that is more elegant and exclusive rather than fun and inviting, then you will undoubtedly want this to be reflected in your sign as well. Consider going with an elegant script font and neutral colors to get this message across. No matter what ideas you have in mind for your company’s next storefront sign, it is important to have a sign company that you can rely on to produce a quality sign for a fair price. Fortunately, if a reputable and experienced sign making company is what you are looking for, you do not need to look any further than Addisigns, your best choice for Tucson signs, to meet your needs. Save yourself the hassle of stressing out over your business’ signs and leave the hard work up to the experts at Addisigns for the hands down best results.